In the CTV News video above, we talk about fall wines for comfort foods. When the weather outside turns frightful, there’s nothing more satisfying than staying home with a warm meal and a good glass of wine. A steaming bowl of stew, a mouth-watering prime rib or a heaping plate of pasta can bring comfort on the worst winter nights. But the meal just isn’t complete without the right wine on the table. And just as our meals become heartier and richer in the winter, the wines that pair perfectly with comforting fare are of the full-bodied kind. Here are my latest wine picks also available as a text shopping list showing the stock at your closest liquor stores. As well, I’ve published a new batch of bargain wines under $15 that taste like $25 wines, from the general section of the store. I look at my wine wardrobe the way I look at my clothing and I think as the weather turns colder, you want to look at the warmer wines. The dishes we eat in the winter tend to be heartier . . . so as the weather cools down, I look for robust reds, particularly Australian Shiraz, Cabernet Sauvignon from Chile or California, or Argentinian Malbec. Other wines also well-suited to the season include full-bodied Bordeauxs and Cote du Rhones. White wine lovers needn’t go without for the winter. There are many full-bodied white wines on the market that also pair perfectly with a hearty winter meal. If you prefer white wine, you still have options during the winter, such as full-bodied Chardonnays. Look for a white wine with some oak in it. When wine is aged in oak it gives it those warm, toasty vanilla flavours that are extremely comforting. When pairing food with wine, there are three things have to work together: flavour, texture and weight. Does your wine have a lot of cherry plum flavours? Is that echoed in your dish? Where texture is concerned, the mouth-feel should be similar between the wine and the food. You want those honkin’ reds and whites to go with a robust dish. A wimpy wine will just get clobbered by a big steak. Steak is best enjoyed with a red wine that has some tannins in it, such as a Cabernet Sauvignon. Tannins are byproducts of the grape skin, stems and pits that MacLean says make your mouth feel furry. If you brewed yourself a cup of tea, put the tea bag in it, walked away and came back an hour later and took a sip, you would feel that gritty astringent feel on your palette — similar to tannins in wine. High-tannin wines pair well with steak because the proteins from the steak attach themselves to the tannins, making both the steak and wine taste better. It’s basically mouth chemistry. High-tannin wines are also a good pairing with meals high in fat. A dish such as Cassoulet — beans layered with sausage, lamb and duck confit, which is cooked slowly in the oven is high in fat, and so serve it with a hearty wine from the southwest of France or a Shiraz. 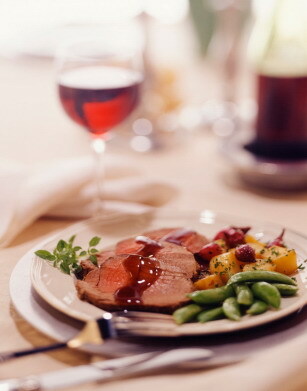 A roast beef dinner is best paired with an Australian Shiraz, Bordeaux or Barbera from Northern Italy. When it comes to pairing pasta with wine, it depends on how it’s prepared. Traditional red-sauce pastas are great with Italian reds whose acidity matches the tangy acidity of the tomato sauce; a crisp Riesling or Sauvignon Blanc will cut through the fat in a creamy white sauce. If you’re dishing out a hearty Irish stew, serving a robust red — a Malbec or Cabernet Sauvignon — will complete the meal. Remember, though, these are only guidelines. The best rule to follow when pairing a wine with a meal is to simply follow the lead of your palette. Posted with permission of CTV news.